I briefly discussed some of the differences between the two major muscle fiber types found in human skeletal muscle (i.e., slow-twitch, or type I, and fast-twitch, or type II), and also indicated some ways in which knowledge of an athlete’s muscle fiber type distribution could, at least in theory, be helpful in optimizing their approach to training and racing. Continuing on from that introduction, in this entry I will describe one of two ways of estimating an individual’s fiber type based on data obtained using a powermeter. As first demonstrated by Gasser and Hill in 1924 (1), the force-velocity relationship of isolated muscle is non-linear – that is, as the speed of muscle shortening increases, force falls off quite rapidly at first, then more slowly thereafter. On a molecular basis, this is because it takes a finite amount of time for the head of the myosin protein to attach to the actin filament, generate force, and then detach before reattaching again at another binding site. Consequently, fewer and fewer such force-generating bonds can be formed as the myosin and actin filaments slide past each other at higher and higher speeds. However, because the myosin found in type II fibers can complete this cycle (and hydrolyze ATP) more rapidly than that found in type I fibers, force declines less rapidly as a function of contraction speed in type II than in type I fibers. The result is not only a higher maximal speed of shortening, but also a higher maximal power output. As well, the speed of shortening at which maximal power is developed is also higher in type II than in type I fibers. These functional differences are readily apparent in Figures 1 and 2 below, which are based on the data Gilliver et al. (2). Figure 1. 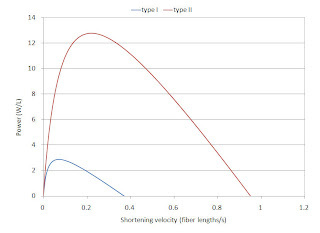 Force-velocity relationship of isolated type I and type II human muscle fibers. Figure 2. 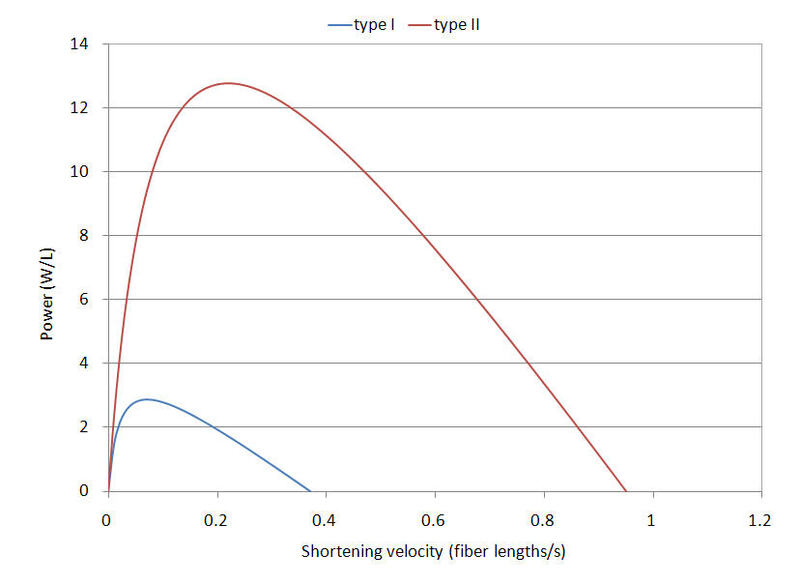 Power-velocity relationship of isolated type I and type II human muscle fibers. Figure 3. 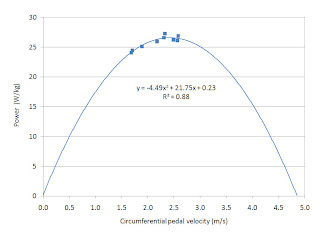 Force-velocity relationship during cycling. Figure 4. 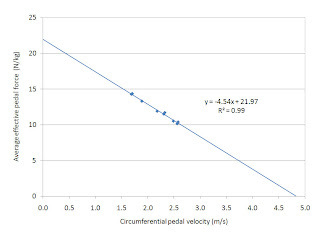 Power-velocity relationship during cycling. 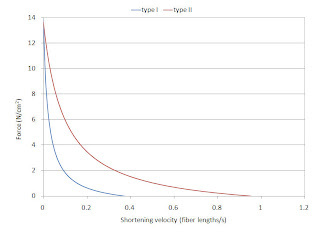 Despite these differences, the same general principles described above apply, i.e., the higher the percentage of type II fibers (especially when expressed as a fraction of total muscle area or volume) an individual has, the less of a decline in force they would be expected to exhibit as velocity (cadence) increases. Consequently, all else being equal they would be expected to have a higher maximal neuromuscular power and a higher optimal pedaling velocity. Indeed, this is precisely what both McCartney et al. (3) and Hautier et al. (4) found for n=2 and n=10 subjects of varying fiber type, respectively. Furthermore, Gardner et al. (5) have demonstrated that field-based tests performed using an SRM can provide force-velocity data comparable to that obtained under more controlled conditions, i.e., on an ergometer in a laboratory setting. Thus, at least in theory it should be possible predict someone's muscle fiber type distribution with reasonable accuracy from such field tests. Cool! But how do I measure my own force-velocity or power-velocity relationship? A detailed answer to this question is beyond the scope of this blog. In essence, however, doing so requires measuring power and cadence with high temporal resolution while performing a maximal effort against just the right amount of external resistance. If the resistance is too great, then significant fatigue may develop before a sufficient number of data points are obtained out/down the force-velocity line or up-and-over the peak of the power-velocity curve. Conversely, if the resistance is too small, then too few (or even no) data points will be obtained on the right-most half of the force-velocity line or on the ascending portion of the power-velocity curve. Perhaps the best suggestion I can make, then, is that people simply experiment, e.g., by performing maximal accelerations from a dead-stop using various gear ratios. Depending upon the conditions (e.g., outdoors vs. upon some form of trainer), this may entail the use of either very small gears (e.g., 39 x 23) or very large gears (e.g., 53 x 12). Regardless, the SRM should be set to record data as frequently as possible, to try to "capture" as many individual pedal strokes as possible. If an insufficient number of data points are obtained during a single effort to permit reliable determination of the force-velocity or power-velocity relationship, data from several short efforts can be combined. For example, the data shown in Figs. 3 and 4 were drawn from five different "gate starts" performed by an elite BMX cyclist, each one of which provided data for just 1-3 pedal strokes (recorded at 0.1 s intervals). 1. Gasser HS, Hill AV. The dynamics of muscular contraction. Proc Royal Soc B 1924; 96:398-427. 2. Gilliver SF, Degens H, Rittweger J, Sargeant AJ, Jones DA. Variation n the determinants of power of chemically-skinned human muscle fibers. Exp Physiol 2009; 94:1070-1078. 3. McCartney N, Heigenhauser GJF, Jones NL. Power output and fatigue of human muscle in maximal cycling exercise. 1983; 55:218-224. 4. Hautier CA, Linossier MT, Belli A, Lacour JR, Arsac LM. Optimal velocity for maximal power production in non-isokinetic cycling is related to muscle fiber type composition. Eur J Appl Physiol 1996; 74:114-118. 5. Gardner AS, Martin JC, Martin DT, Barras M, Jenkins DG. Maximal torque- and power-pedaling rate relationships for elite sprint cyclists in laboratory and field tests. Eur J Appl Physiol 2007; 101:287-292. At some stage I expect to gather more start data as my NM power has improved since then but I suspect my results will always be a bit skewed. Unfortunately my pre-amp start data is all Powertap data and not sure it would be suitable. The cherry picking I've done so far gets me >80% type1 with this formula. I'm not sure how appropriate the data I've used is. Some from rolling starts on the road with 1s recording, some from standing starts on the track, 0.5s. But the track starts are not quite maximum efforts, so I'll do some specific testing. What muscles would you say are most affected by high cadence intervals, Say my Freely Chosen Cadence is 103 and I do an SS interval at 115 for 15 minutes, what muscles would I be recruiting? And the same for this, what if I do a 5 minute interval at 140rpm (lowest power possible to attain this cadence) what muscles am I using there? And what about climbing, if I climb at 60rpm at SS power what muscles there?